*CLUB EDEN is Washington DC's #1 Party Venue (21+)* We have limited VIP Tables* DRESS TO IMPRESS!!! * 6 Hours of Non-Stop Entertainment'* Every Year This SIGNATURE Annual Event is SOLD OUT! 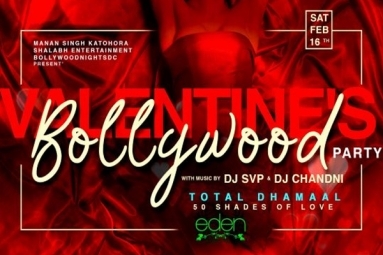 Bollywood VALENTINE'S Party "TOTAL DHAMAAL - 50 Shades of LOVE"
* CLUB EDEN is Washington DC's #1 Party Venue (21+)* We have limited VIP Tables* DRESS TO IMPRESS!!! * 6 Hours of Non-Stop Entertainment'* Every Year This SIGNATURE Annual Event is SOLD OUT!